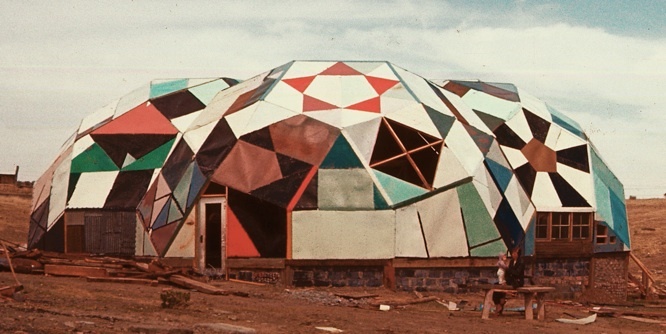 For the first time a group of about 12 adults and child inhabitants designed and then started to live inside domestic domes inspired by the geodesic design principles of Buckminster Fuller. It starts a concept they called â€œDrop Art". These house-domes were built without a systematic kit or an exact design and they represent an alternative to Fuller's ideas. Influenced by Allen Kaprow's "happenings" and new theories and performances by John Cage, Buckminster Fuller, and Robert Rauschenberg at Black Mountain College, they were determined to break art out of the confines of museums and galleries and integrate it with everyday life. To create a â€œlive-inâ€ work of Drop Art, they founded Drop Cityâ€.